Who doesn’t love choice, especially when you’ve got people of all ages and sizes in your family to satisfy? But when you’re facing the stunning array of choices that await your family at North America’s largest mountain resort, it can feel a bit overwhelming. Fear not, brave vacationer, for I have pulled together the best of the best from all my insider knowledge to give you the perfect 3-day itinerary (plus some bonus bits) for an unforgettable getaway at Whistler Blackcomb. Before we get started, this is probably a good time to pass along a few important “equipment” tips, especially for Day One (in the alpine). Make sure your camera of choice is fully charged – it’s going to be working overtime! If you plan on doing any hiking or even just want to visit the Cloudraker Skybridge (more on this below), I can’t overstate the importance of appropriate closed-in footwear – sandals are best left for your off-mountain activities! And if you’ve got some mobility restrictions (strollers, wheelchairs, etc), your options may be limited. 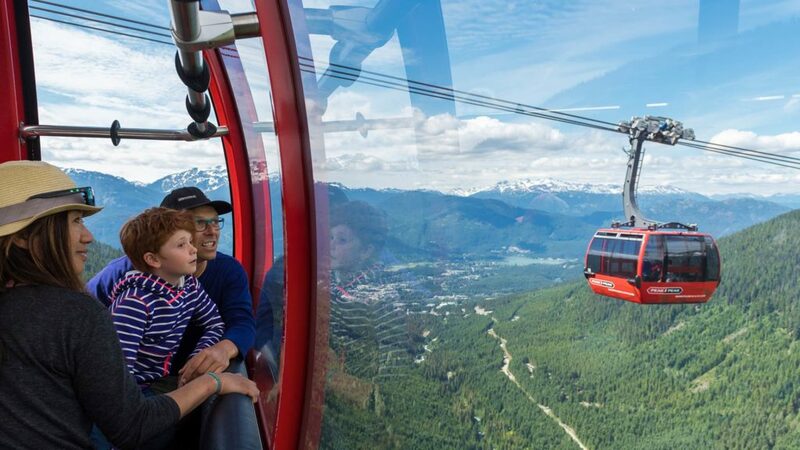 I can’t think of a better place to begin your 72-hour family adventure than way up on these two magical mountains and my new favorite way to get started is on all-new Blackcomb Gondola. 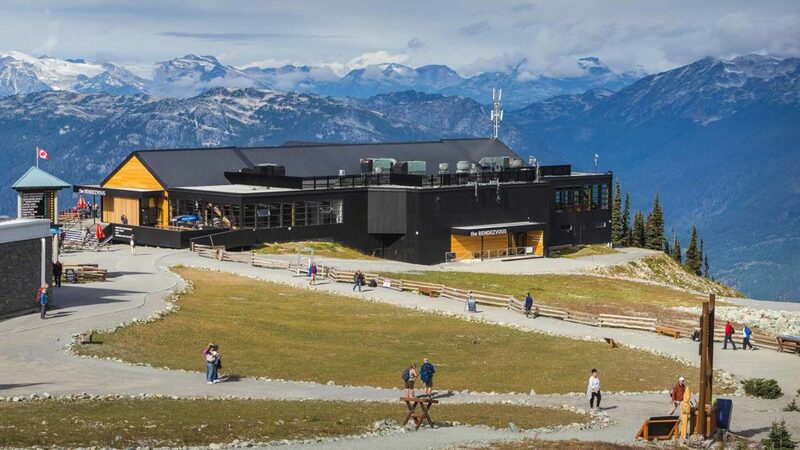 Head over to the Blackcomb Base and climb aboard the super-fast new gondola to your first stop: the Rendezvous Lodge on Blackcomb Mountain at an elevation of just over 6,100ft/1,860m. A fantastic way to quickly immerse yourself in the mountain experience is on a quick and easy walk (about 30 minutes) around the aptly named Alpine Loop, a gentle route that begins and ends at the Rendezvous Lodge with spectacular views of the awesome Fitzsimmons Valley as it winds through a sub-alpine forest. Be prepared for some excellent photo opportunities! After arriving at back at the Rendezvous Lodge, I suggest grabbing a delicious snack or lunch at the Rendezvous Lodge to refuel your energy (the young ones will love their kid-friendly menu). After arriving at Blackcomb Mountain, I suggest popping into the amazing Alpine Theatre for a fun video that’ll really “immerse” your family in the mountain experience. After such a busy start to the day, you’ll probably need a little fueling up so why not grab a tasty lunch a t the newly-renovated Rendezvous Lodge (the young ones will love their kid-friendly menu). Your amazing ride aboard the PEAK 2 PEAK Gondola will take you all the way across (on the world’s longest unsupported span for a lift of this kind!) to the Roundhouse Lodge on Whistler Mountain. 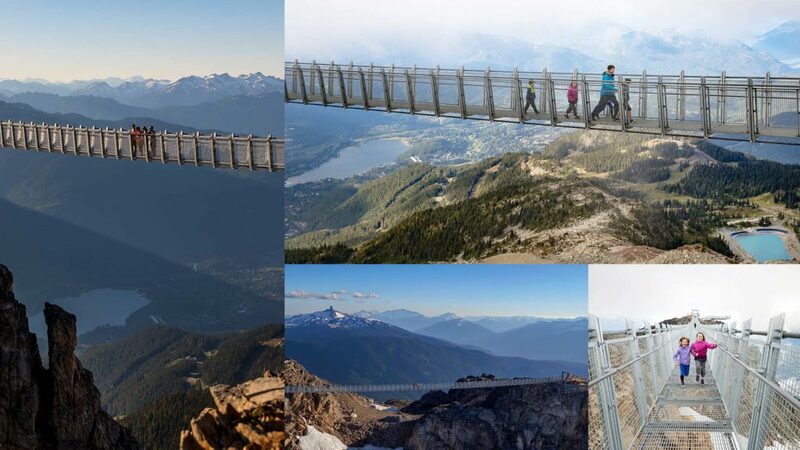 While your adrenaline is still flowing, this is a perfect time to head up to another one of Whistler’s newest experiences – the breathtaking Cloudraker Skybridge! To get to it from the Roundhouse Lodge, just take a short walk down to the Peak Express open chair lift which will get you up to the Top of the World Summit (height alert: children will need to be at least 4ft tall to ride it). Once you’re on the bridge, you’ll feel totally secure but, unless heights don’t bother you in the slightest, prepare for a mild case of butterflies (yes, you can see straight down!) 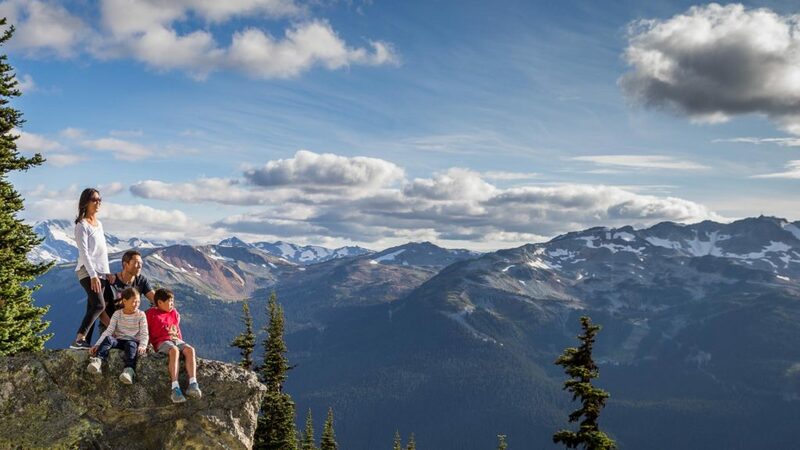 as you traverse the grated walkway from the peak of Whistler Mountain to the West Ridge and soak up the exhilarating views high above Whistler Bowl. The Cloudraker Skybridge will quite literally take your breath away (in an exciting way) – DO NOT MISS IT! After all that thrill-seeking, this is probably a great time to head back to the Roundhouse Lodge to catch your breath (and soak up even more jaw-dropping views from the deck) while the kids get into some cool stuff: getting their picture on a podium with spectacular alpine vistas, sitting in the driver’s seat of a snowcat or ATV, or hanging out with an Inuksuk (you’ll see what I mean when you get there). 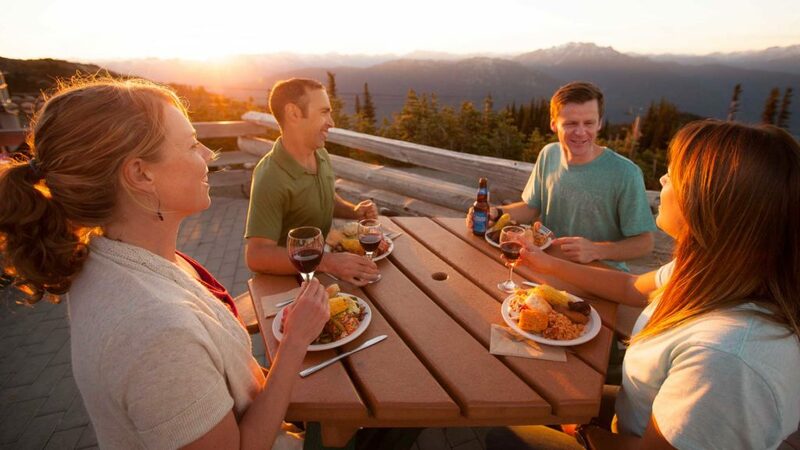 If you’re in the mood for a meal, I highly recommend the Roundhouse Lodge’s family-friendly Mountain Top Summer Feast. It’s an incredible, mouthwatering dining experience with fantastic live music and breathtaking 360º views of the valley and surrounding mountains, and it happens every Friday, Saturday and Sunday evening (first seating starts at 5:30pm). Well, I trust you all had a thoroughly entertaining Day One on the mountain! It’s time to head back down to the valley (an easy download on the Whistler Village Gondola) for whatever your evening has in store for you. But don’t hit the sack too late – we’ve got big plans for tomorrow! TIP: Buy your PEAK 2 PEAK sightseeing ticket in advance to save. Or opt for a PEAK 2 PEAK 360 Season Pass (it costs less than two individual day tickets and gives you loads of other perks and savings). 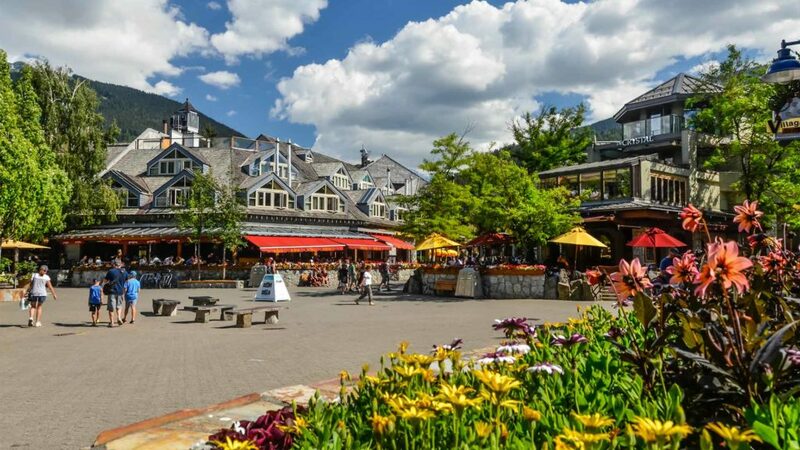 Now that you’re Masters of the Mountains, it’s time to see what special treats await you down below in Whistler’s amazing valley, and there’s no better place to begin than in the pedestrian-only resort village that many feel is the most awesome on the planet. An always-great way to start your family’s day is with a wholesome breakfast served out on a sun-drenched patio watching people from around the world stroll by. There are countless restaurants and cafés in the Village to choose from, each serving up their own unique mountain flavours. After breakfast, head off to explore the countless shops (fair warning: Whistler is a shopper’s paradise, so I suggest making a list of things you want to come back for tomorrow!). I have to think the kids (and you) would love a mid-morning treat so why not pop into one of the many ice cream parlors in the village for a cool Whistler creation. Then head over to Whistler Olympic Park where you can explore our legacy venues and learn about the 2010 Olympic and Paralympic Winter Games. While the afternoon is still young, it’s a great time to visit other great kid-friendly spots in Whistler such as Lost Lake, Whistler’s Outdoor Water Park and the Family Adventure Zone presented by Nintendo. The Lil’wat Cultural Center is a really unique place to spend some family time. It’s a wonderful showcase of the art, history and culture of the Squamish and Lil’wat Nations with lots of ways to have fun, including trying on some traditional regalia, playing a drum, and discovering their interactive exhibits. 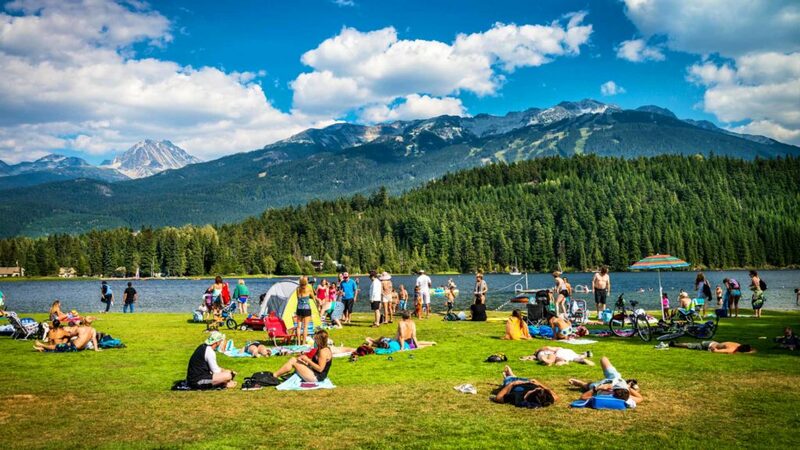 One of the fantastic summertime features of Whistler that catches many visitors by surprise is its incredible collection of rivers, lakes, and beaches. All are easily accessible, have washroom facilities and most feature great amenities for families, including kids’ play areas, grassy fields and picnic tables. Enjoy non-motorized sports on the lake. Most parks offer kayak or canoe rentals, and some have volleyball and tennis courts. For a closer look, check out Lakeside Park, Lost Lake, Rainbow Park, Alpha Lake Park, Meadow Park, and Wayside Park. 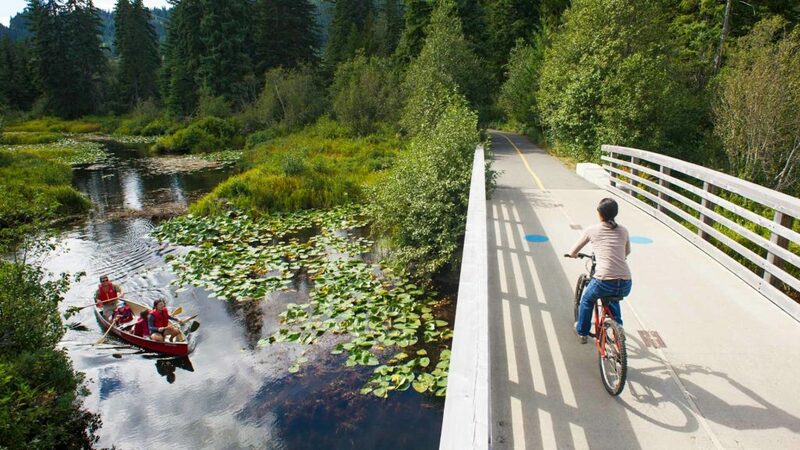 Speaking of kayaking and canoeing, I consider them to be summertime must-do’s in Whistler and perfect for families. How can you beat floating along the gorgeous rivers and lakes of Whistler while soaking up all that the great outdoors has to offer? Highlights include Green Lake and Alta Lake – and don’t miss the River of Golden Dreams! If it’s thrills you’re after, nothing tops putting on a wetsuit and getting wet as you fly down the rivers of Whistler going through beautiful lakes and exhilarating rapids. With options for all skill levels, this activity is perfect for families. Bring the family to stay at the iconic Fairmont Chateau Whistler. Enjoy onsite restaurants where kids 5 and under eat free off the children’s menu, and several indoor/outdoor pools. Kids even get their own child-size bathrobes. 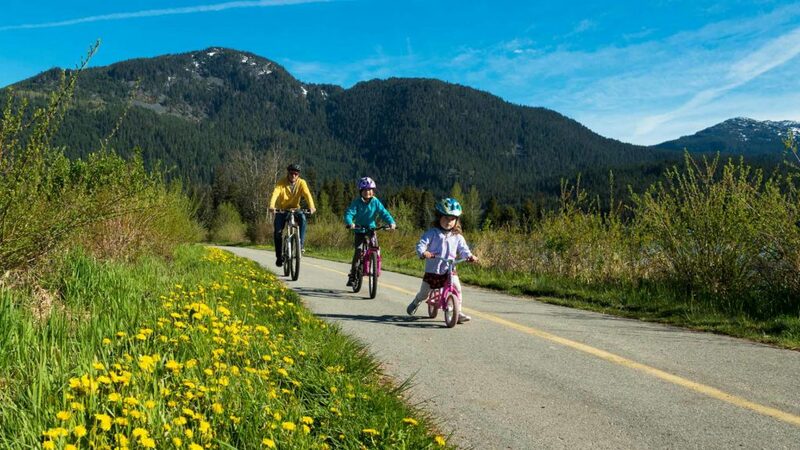 Located conveniently at Blackcomb base ideally where the Family Adventure Zone also is! Named by Condé Nast as the 10th top resort hotel in Canada, the Hilton Whistler Resort & Spa offers an array of amenities and services for your family’s comfort and convenience. Enjoy a large pool, basketball court and children’s menu at onsite restaurants. Offering one and two bedroom units with full kitchens, plus all the creature comforts (including hot tub, sauna and one of the largest outdoor heated pools in Whistler), The Cascade Lodge in Whistler Village North is a great choice. Located at the foot of Blackcomb Mountain, Horstman House is an elegant lodge featuring a Kids Centre, adult games room with a wide-screen TV, billiards table, fitness centre, outdoor pool, hot tub… well, you get the idea! In the amazing Creekside area, just a 5 minute drive from the Main Village, Legends Whistler offers spacious one, two and three bedroom suites, including full kitchens, in-suite washer/dryer, and gorgeous views. The kids will love the Games Room and large pools! On weekends from May through September, bring your picnic blanket and dancing shoes to the Whistler Olympic Plaza and enjoy the free Whistler Outdoor Concert Series. 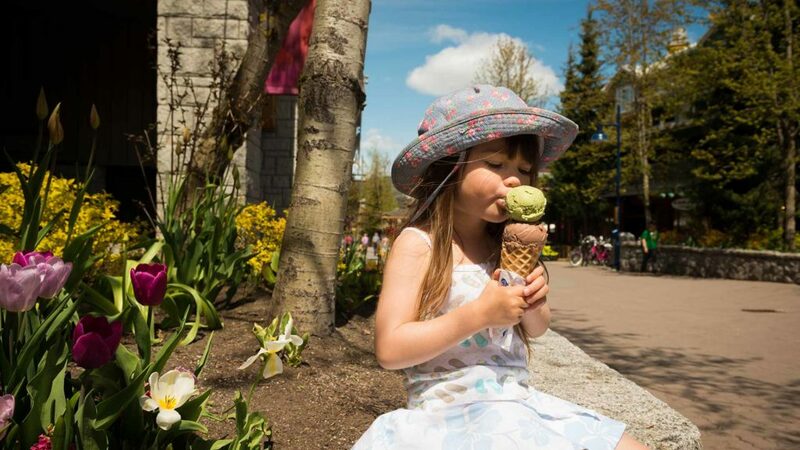 The open-air Whistler Farmers’ Market (held twice a week from May to October) is a fun outing for the family, showcasing local food and art, refreshing beverages and live entertainment. 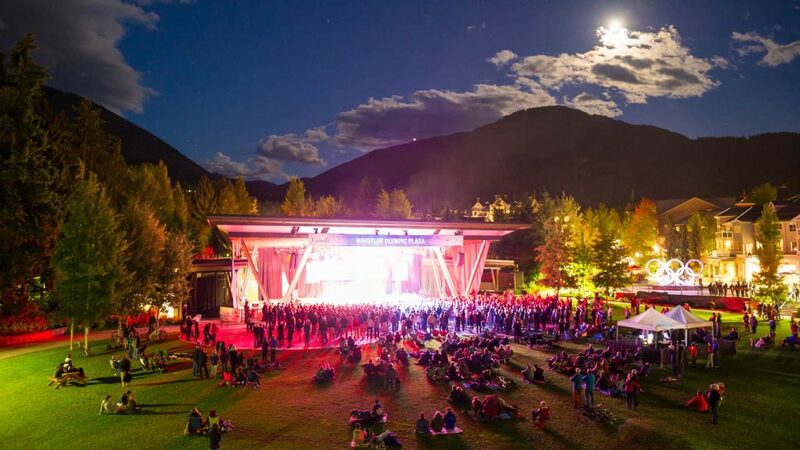 With tons to see and do, including free, family-friendly performances by the world-renowned Vancouver Symphony Orchestra, Whistler is the perfect place for a fun-filled Canada Day long weekend, June 29-July 1. Catch the Whistler Children’s Festival, July 5-7 at Whistler Olympic Plaza. There’s fun for the whole family in this action-packed weekend of workshops, live musical performances, and other amazing creative stuff. For Whistler’s tastiest summer event, check out the mouth-watering food and rockin’ concerts at The Canadian National BBQ Championships from August 2-4. You’re guaranteed to be mesmerized by the gravity-defying feats of the world’s best downhill bikers during the 10-day Crankworx competition at the Whistler Mountain Bike Park (August 9-18). With so many places in Whistler to eat, drink and be merry, it’s impossible to know where to begin. For families, here are some of my personal highlights. The après scene at Whistler Blackcomb is the envy of mountain resorts everywhere with some super-fun family choices at the base of the mountains. The GLC is in a prime location above the Whistler gondola, overlooking downhillers as they charge through the mountain bike park (and its family friendly until 10p.m.). Dusty’s is really popular and nestled into the base of Whistler Creekside while Merlin’s at Blackcomb Base is one of the most famous fun-time venues in the whole resort. For lots of laughs and a menu that will put a smile on everyone’s face, big and small, check out the Old Spaghetti Factory and their amazing offerings of pasta, special sauces, and lip smacking desserts. One of my favourite places to go for pizza (who doesn’t love pizza?) is Creekbread, where the whole family can watch while your choice of all-natural pizza is baked in a primitive wood-fired oven. Believe me when I say that you WILL give in to temptation when you see the stunning freshly-baked dessert goodies waiting for you at Purebread. What family outing would be complete without ice cream, and I can think of no better place to drop in for some delightfully original (not to mention irresistible) cool treats than Cows Ice Cream.